It takes a special player to earn a nickname. Nicknames are typically given to these special by his peers at club or school level by fans and by the media. And throughout its history , Kogalo has seen its fair-share of such special players. Many Kogalo players have earned nickames that arise from politicians who happen to be making the news at the time. Thus the legendary Nahashon Oluoch was nicknamed “Lule” after the short lived Ugandan president of the time, Yusuf Lule. In the early 1990s, there as a fellow by the name of Brigadier Odongo whom former president Moi accused of plotting to overthrow the Kenyan government. Nobody knew if this Brigadier Odongo existed or whether Moi was just creating this fictional character to gain attention. Gor Mahia striker Steve Odiaga who was nicknamed “Brigadier” by fans after this fellow. Ethiopian, Michael Teshome Zelleallem played for Kogalo briefly and impressed fans so much that they nicknamed him “Saddam”. This was around 1990 when President Saddam Hussein invaded Kuwait using scud missiles. Kogalo fans at the stadium would be heard shouting “Saddam tupa scud pale” (Saddam throw a scud missile there), each time Teshome touched the ball. Gideon Hamisi was dubbed “Aziki” after Nigerian former president Mnamdi Azikiwe. 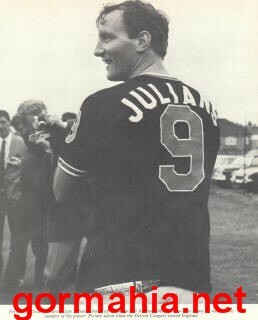 Other players are given nicknames based on their playing characteristics. Full back Paul Oduwo was dubbed “Cobra” because he stung opposing strikers with his robust tackles. Tobias Ocholla was dubbed “Jua Kali” for his tight marking. And of course Bobby Ogolla whose name “Six Million dollar man” was because of his amazing physical strength. So strong was Bobby that his shots often ripped the net. Six million dollar was a popular TV superhero of the early 1980s. Austin Oduor was nicknamed “Makamu” because at the time he was the vice captain. An alternate story suggests that the name Makamu came about because in his formative days, he was always a supersub. George Odembo Nyangi was dubbed “Artillery” because of his powerful shots that made it look like he had rocket launchers in both feet. George Onyango was subbed “Fundi” because he was the technician who architected many of Kogalo’s moves. Legendary midfielder Allan Thigo was dubbed “Ogango wuon pap” due to the fact that he seemingly controlled the entire football field. Peter Dawo was named “Omuga” which means rhinocerous in Dholuo due to his aggressive playing style. 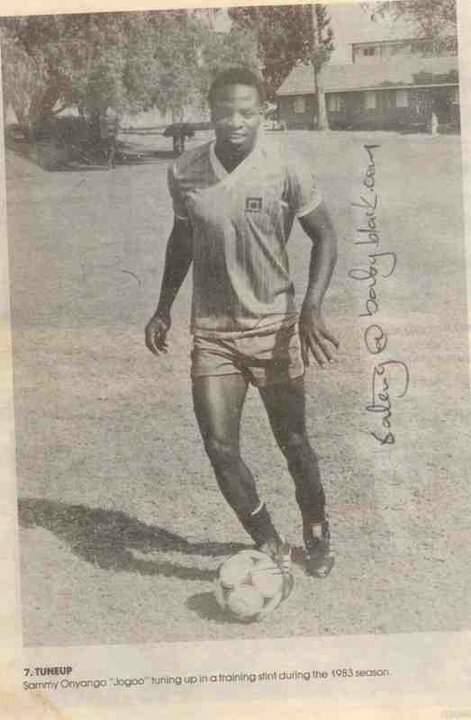 Ben Oloo was dubbed “Breakdance” because his amazing dribbling skills made opposing defenders dance and Breakdance was the prevailing dance craze of 1985 when he joined Kogalo. Mike Ogolla “machine” got his nickname because he played the sweeper position with such ease that he seemed to be doing things automatically hence the nickname “machine”. Rarely is a player nicknamed by a coach. But so crucial was Charles Otieno that coach Len Julians dubbed him “The Engine”. This was because Charlie literally drove the team forward and provided power for the whole team according to Julians. One nickname that came from a childhood event is that of William Ouma “Chege’. It is said that Ouma Chege got his nickname because while playing football in the neighbourhood, he broke the glass windows of a certain man known Mzee Chege. The man would often come of his house yelling William Ouma’s name. Eventually people started to call him William Ouma “Chege”. In some cases, players are named after certain events. Abbas Magongo was nicknamed “Zamalek” because a red card given to him was the root cause of the Zamalek affair that caused Kogalo to be banned from continental football for 2 years. Keeper Charles Omondi, now a Gor Mahia assistant coach was dubbed “Korea” because he was a member of the Kenya Under 16 team that toured Korea in 1984. Sammy Onyango was dubbed “Jogoo” because when he first joined Kogalo in 1979, he was still a secondary school student at Equator high school and he would take a bus called “Jogoo Kimakia” everyday from Thika to Gor Mahia’s training ground which at the time was Railway training school in South B. Some nicknames occur from the most interesting phenomenon that is happening at that particular time. Hence George Odhiambo was nicknamed “Blackberry” after the most popular smart phone of 2009. Peter Otieno’s nickname “Bassanga” is said to have come from a Congolese musician based in Nairobi. The Peter Okeyo who played in the early 70s was dubbed “Kapila” which was a popular vehicle of that era, the Ford Kapila. In many cases , players are nicknamed after the most popular players of the time. Sammy Owino was dubbed “Kempes” after the legendary world cup winning striker from Argentina, Mario Kempes. Jared Ochieng was subbed “Makanaky” after the popular Camerounian who exploits captured the minds of many at the 1990 world cup. The same was the case for Paul Ochieng who was dubbed “Kunde”. Both Ochieng and Kunde were tall and built like tanks. 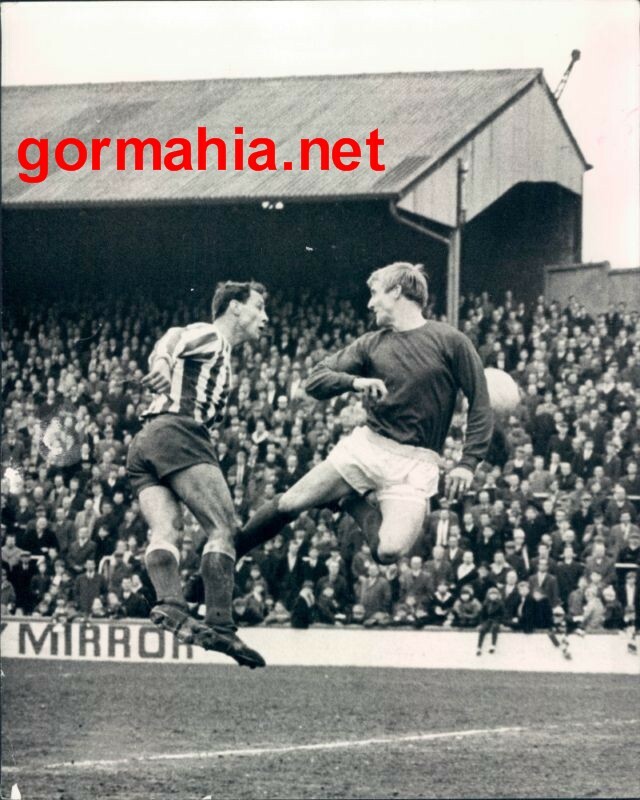 George Yoga was dubbed George “Best” after the famous Irish legend. Some players have names that are a play on their names. Such was the case with Isaiah Omondi who nickname was “Janabi” after the Bible prophet. Janabi means prophet in Dholuo. Circa 1987, fans would carry Bibles to games a read a verse from the book of Isaiah before games. Sometimes players are named after their professions. Full back George Otieno was dubbed “Chumb Reru” because he worked for Kenya railways. Chumb Reru means railway lines in dholuo. 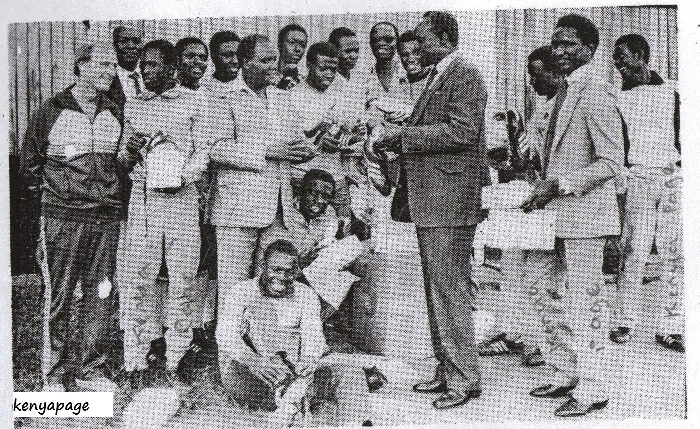 Team-mate Tairus Omondi also worked for Kenya railways and was nicknamed “Tairero”. Striker Maurice Ochieng was a playground legend in Kaloleni and was dubbed “Sonyi” by Kalolenites. Sonyi was the prevailing sheng word for Policeman in the 70s and early 80s. In some cases, players arrive at Kogalo with ready made nicknames from their secondary school days. Peter Ochieng was known as “Pierre” during his glory days playing at Highway secondary school. John Okello arrived at Gor Mahia from Kisumu Police with the nickname “Zangi”. he earned that nickname in his youth days in Kisumu Nyalenda. It came from a play on a name of famous musician “Bokelo Isenge”. Since his name was Okello, people started to call him “Okello Isenge” which eventually became Okello Zangi”. Sammy Omollo, now coach of Tusker was well known as “Pamzo” before he joined Kogalo. Kevin Omondi was already known as “Daddy” during his glorious playing at Langata secondary school. Zablon Otieno who played for Kogalo until recently was dubbed “pro” by his schoolmates as was current coach Zedekiah Otieno whose nickname was “Zico” in school. David Odhiambo’s nickname was “Deo”. was a truncation of his first name. Other nicknames are still a mystery and yours truly has no idea where they came from. There was David Ochieng who was nicknamed “Kamoga”. Fans named him Kamoga after Ugandan burly striker Davis Kamoga. 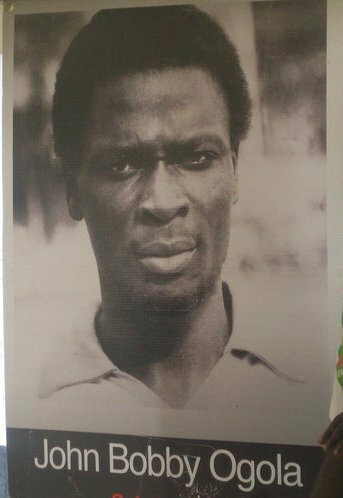 And of course there were other interesting nicknames like George Otieno “Vigo”, John Otieno “Hatari”. Which current Kogalo player has the potential to earn a nickname from fans ? In a match that was played only two days after the FKL cup match against Kapenguria heroes, Gor Mahia were sunk 1-0 by SoNy Sugar. It was SoNy Sugat who started the game brighter. The goal that sunk Kogalo came in the 48th minute via Hugo Nzangu. Gor Mahia are now still in second place but the gap between them and leaders Tusker is set to widen. Tusker are now 5 points ahead of Kogalo. Its worth noting that Gor Mahia have hardly scored any goals against other premier league teams since they beat AFC. Having received a reprieve despite loosing to Congo United in the previous round of the FKL cup, Gor Mahia took no chances this time and put 6 goals past Kapenguria heroes. On this day, Gor Mahia fielded mostly second string players starting with goalie Ronny Kagunzi. The heroes shocked Kogalo when they took an early lead following a defensive lapse. Gor Mahia came back storming with goals from Moses Odhiambo (2), Dennis Odhiambo, Tony Onyango, Dennis Okoth, John Kiplagat. Gor Mahia will now face off with West Kenya Sugar on September 4 in Nairobi. West Kenya Sugar were loosing finalists in 2010. According to a story in the local dailies, groups of Kogalo fans have called on The Kenya Premier league to end price gouging by teams hosting Kogalo. The fans, draw from 65 branches countrywide, said they are subjected to unfair gate charges unlike other clubs. Speaking to the Star on phone from Nakuru after their barren draw against Ulinzi Stars, Gor Mahia organising secretary Tom Ataro said the fans are tired of being overcharged because of their love for the team. “In Nakuru, they charged as Sh500 for the non-existent main stand and Sh200 for the Russia stands. This has been the case for almost all our matches. Why should our fans be punished for supporting us?” asked Ataro. Gor Mahia, who have the largest fan base in Kenya, are credited as having brought back fans to stadia during league matches. Opposing teams have been taking advantage of K’Ogalo’s large following to make a kill from gate collections. Most of the KPL clubs now want to host their home matches in Nairobi, while they hike their ticket prices up to Sh300 from the normal Sh100. Some teams have even used security as excuse to have their home matches moved to bigger stadia where they would eventually accommodate more fans, translating to more money. Home teams take all the gate collections. Ataro said KPL should intervene to save the poor Gor fans who sacrifice a lot for the sake of their team. The match between Kogalo and Ulinzi that was played at Afraha stadium ended in a scoreless stalemate. The first half was evenly balanced with Stephen Ocholla of Ulinzi hitting the upright in the 19th minute. On the half hour mark, Demonde Selenga put Wycliff Ochomo through but Ochomo could not finish the glorious chance. Rock solid defender Eric Masika had to leave the game with a concussion. He was replaced by Chris Wekesa. The introduction of Hajji Mwachoki and Moses Odhiambo still did not get Kogalo a breakthrough. Jerim Onyango was once again instrumental in saving Gor Mahia from loosing with a series of good saves. The match was very well attended by Kogalo’s travelling band of fans. Ever since Gor Mahia beat their arch rivals 3-1, the performance has been wanting. And if not for the heroics of certain players, most notably Jerim Onyango, things could have really gone south for the club. Onyango’s superb play has seen him earn player of the month honours. Gor Mahia are now four points behind Tusker who won their match on Saturday.